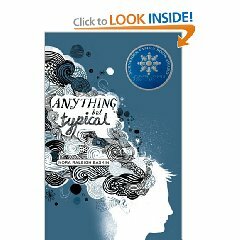 You can’t help but love the main character, Jason, a sixth grader who is diagnosed with autism along with “numerous disorders, most with labels like alphabet soup”. For any teacher who has ever had a student on the autism spectrum, you’ll be reminded of them while reading. I was cringing when reading the part about the substitute librarian who was trying to get Jason to “behave like other kids” and not freak out over someone using “his” computer. It brings back memories of my first interaction with a student, not then diagnosed with autism, when I was a young(er) teacher. At the time, I could not understand the intensity with which he blatantly ignored my request that he put on his glasses. Why were my normal teacher charms working? Written from Jason’s point of view, the author really takes you into the mind of Jason and how he views life with “neuro-typicals” ( his family members-brother, mom, dad; his classmates). I enjoyed the clarity he was able to view himself and others with. I also really enjoyed Jason’s on-line writing community. So many students that I’ve worked with on the spectrum have not enjoyed writing or written output. It made me so glad for Jason that he was able to connect with others in a safe forum. 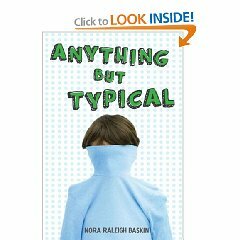 There is a new paperback cover-coming March 2010-I am trying to soft-sell the book to my daughter to help her with her understanding of the many different types of people we encounter in school and life. 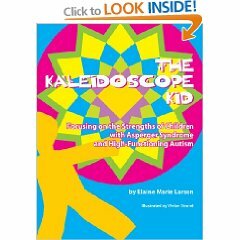 “The Kaleidoscope Kid is written to remind children with Asperger Syndrome or high-functioning autism of their many special gifts and to make others aware of them, too. I hadn’t seen this book before we bought it for our elementary school guidance counselor. She and one of our intervention specialists were familiar with the author’s other book Chameleon Kid and had found it to be a successful read-aloud with primary students who are in inclusion kids with children with Asperger Syndrome or Autism. This book is presented as a series of attributes and related poems that celebrate positive traits of all children. One two page spread is K-I am Knowledgeable with a poem entitled Dinosaurus Infomaurus. Bright colors, and primary shapes will appeal to young children and the book would be great to use at the beginning of the year as you develop your classroom community. It would be a great book to use with guidance programs as you talk about how we are all unique.